What is the minimum ceremony for a 'barebones' legal wedding? We are asked this repeatedly, by couples who are eloping, or who just want to have a basic legal wedding ceremony, without any fuss. We've answered it in several places, but here is another rundown, just to be helpful. 2. The Intention - "Are you, [name] here of your own free will, and do you intend to marry [name]. This is the "I do" that you answer individually, in front of witnesses, either 2, or 200 of them. In the UK and a few other countries, you then say "Is there anyone present who has any reason why this couple may not lawfully be joined?" In most US States, this question is answered when you fill out your license, indicating the disposition of any prior marriages, divorces, etc. your age, and whether you are too closely related to be married. This means you do not have to repeat this question at a wedding ceremony. 3. The vow: "I [name] take you [name] to be my lawfully wedded husband/wife". You are speaking to your intended spouse, not to the minister, and not to the witnesses, as in step 2. You have turned to face each other, and this is your promise to become each other's legal partner.You may say this in your own words, and there are many variants. 4. The Signing: The officiant and the witness/es sign the license and date it (sometimes to the second, in a state where you have a waiting period). The Bride and Groom may sign as well, depending upon the license. They have already signed when they applied for the license. 5. The declaration: "In front of these witnesses, this couple has declared their intention to join their lives in marriage..and we now accept them as husband and wife". The words can vary, of course - But the PURPOSE of each step is the same - establishing WHO you are; if you are here of your own free will and it is your INTENTION to be married; your PROMISE to the other person to be their spouse; the legal SIGNING of the license, and the DECLARATION by the officiant that we have witnessed this legal contract. Make sure your ceremony has these basic, minimal parts, and that your officiant is properly licensed, and that they file the license on time with the state issuing agency. If you are having a civil ceremony and planning another ceremony later, you can just do these 5 steps, and leave the rings and blessings till a second ceremony. Just add the procession, flowergirls, readings, blessings, candles, music, etc. and you have the full Monty wedding service. 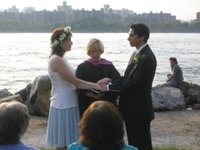 Here is a version of this ceremony we use for short weddings. Feel free to adapt!